Last night we were contacted by some friends who wanted to congratulate us for the good article posted on the influential wine and food blog of Luciano Pignataro. We were pleasantly surprised and honored by the praises to our wines, Millesulmare and Calmarossa, written by the journalist and sommelier Fabio Panci, who tried a Calmarossa of 2011 and a vertical tasting of Millesulmare at Vinitaly. We thank Fabio Panci and Luciano Pignataro for their appreciation and we are reporting the part on SantaMariaLaNave as follows. Below you will find the link to read the full article. 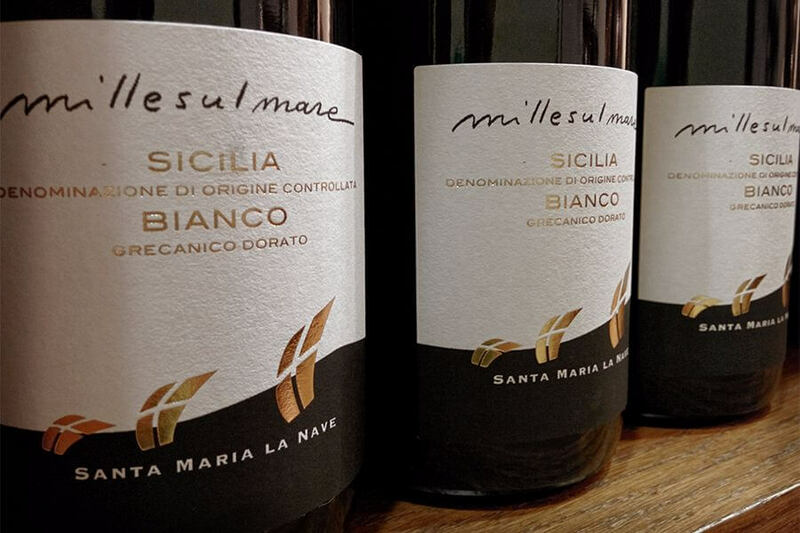 “Here at last two reals gems, found almost by chance, produced on Mount Etna in the quantity of a little more than 6000 bottles by the microscopic company SantaMariaLaNave, owned by the Mulone family. The young owners, with the expert advice of the historical Benanti winery, have chosen to bring back to light a wonderful vineyard, located at 1100 meters of altitude above sea level (one of the highest in Europe), vinifying ancient vine varieties like Grecanico Dorato, Albanello and, of course, Nerello Mascalese. Only if you have been on Mount Etna and have seen the different soil composition depending on the many eruptions following one another during the centuries, you could understand how here, more than anywhere else, the soil itself shapes the nature of a wine. Grecanico Dorato is no exception; this vine variety has always grown on the slopes of Etna, but it is almost impossible to find it in its monovarietal version. Since I don’t have any term for comparison at least for the white wine, I can only say that I was very surprised by the floral, dehydrated fruits and hydrocarbons scents, by its spiciness and great freshness on the nose, and by its complexity and persistence on the palate. Three different vintages for three completely different wines because, as the owner reminds me, at 1100 meters of altitude it is the volcano which decides the olfactory and taste profile of a wine, not the man. Finally the red wine, produced with Nerello Mascalese and reflecting the standards of this vine variety, with its red fruits, acidity and tannin scents on the nose that make him compete for the role of “king of hardness”, and with a strong alcoholic content. A red wine that will be fully appreciated after at least two years. Malolactic Fermentation: All the Things You Have Always Wanted to Ask but Never Dared to. Langosteria 10: the Best Fish Restaurant in the Heart of Milan!